Digital Signage – What is it? Digital Signage, or Digital Signage, is the common term for anything that concerns information screens and settings. It is one of the fastest developing markets in the IT field and an area we have specialized in over several years. By hardware, most of the settings consist of one to several quality displays and associated PCs for viewing / playing content. In addition to the hardware, software is required to maintain and monitor operations, and often also a content system (CMS), to compose and distribute presentations to the displays. In this category, we have collected our selection of suitable Displays, PC devices and Panel PC devices for digital signage / info screen installations. in CompuLab Nordic we have provided a large number of complete infoscreen and infoscope installations and we would like to share our experience in the field. Choosing the right hardware and software is crucial for a stable and satisfactory installation and there are many conditions to be considered. All our products are carefully selected with focus on quality and operational stability. Often, the information screen's installations are in impassable places, whether due to hidden fitting, over ceiling panels, distant locations or anything else. It is therefore particularly important that the equipment used can withstand many hours of operation and, for example, can withstand low / high temperatures if required. Our range of monitors is wide, and we collaborate with a wide variety of manufacturers and distributors, so we can always find the right screens for new projects. The category runs from 16/7 and 24/7 approved signage displays to office environments, schools and the like. for industrial grade displays for extreme environments. In all categories there are different sizes, with and without Touch technology, variants for mounting, mounting, etc. 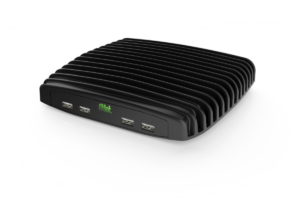 When selecting a PC device for digital signage, the desired one is often a small size with good graphics capabilities. In addition, we recommend a blower-free PC with passive cooling, as a blower draws dust into the PC, which in turn causes maintenance and, in the worst case, unstable operation or a defective PC. Therefore, all our Player PCs are without fans or other moving parts. We can deliver them with Windows 7/10, Windows Embedded, Linux as well as our own customizable Signage Player Software based on Linux. 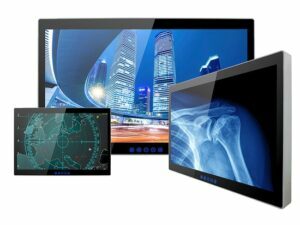 Our range of All-In-One / Panel PC devices, where the PC part is integrated into the screen. From 10" ultra-compact panels to IP-protected models that can withstand dust and water.